If you know better precepts than these, candidly tell me ; if not, follow them as I do. Horace. The Authoress would not have been thus daring had she not ascertained by her own experience, as well as that of many friends, that whatever the other merits of previous works on the subjects of cookery and household management, they are not practically available for the moderate and economical, yet reasonably luxurious, housekeeper, or for those who are young or who are inexperienced in those matters. In those works there is no lack of receipts, maxims, and 4 directions to the cook ; ’ but in general, when tested by a moderate cook, or directed by an inexperienced person, failure and disappointment are the result. 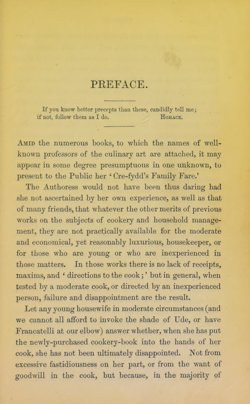 Let any young housewife in moderate circumstances (and we cannot all afford to invoke the shade of Ude, or have Francatelli at our elbow) answer whether, when she has put the newly-purchased cookery-book into the hands of her cook, she has not been ultimately disappointed. Not from excessive fastidiousness on her part, or from the want of goodwill in the cook, but because, in the majority of instances, the receipts and directions are only suited to those cooks who are well informed, and have had considerable practice (see note, p. xi.). They are often the result of theo- retical ingenuity, or the productions of those who know, but who cannot impart their knowledge to the uninformed. Theory and practice must be combined ; and that com- bination put forth in such language, that while the lady will not object to read, the cook will be able to understand. The Authoress of the present work has, from various motives, sought opportunities, and from peculiar circum- stances found them, of acquiring the receipts it contains. They are not all new to the Public, though many of them are, but they have all this recommendation — that they have been tested, and served on the table of the Authoress, under her direct supervision. Those dishes have past the ordeal of fastidious and almost morbidly critical palates, and have come forth with ap- proval. The materials suggested are reasonably econo- mical, the quantities exact, and the directions plain. The words 4 reasonably economical ’ are used advisedly, as it would be insulting to the understanding of sensible persons to state that inferior materials can be formed into superior dishes. In addition to the receipts on cookery, the Authoress has introduced a variety of other receipts and suggestions for the management of a house and ser- vants. With regard to servants, it may be observed that many of them would be much better for the gentle but firm directions of a kind mistress Experienced and skilful servants need no direction ; but such are not always to be found ; and when found, the rate of wages required by them would not be suitable to persons with a moderate income. A mistress, under such circumstances, if she would have a comfortable establishment, must be able, in some degree,’ to instruct her servants ; without this, it is impossible that they, who have but little experience, can know the wants incident to a respectable family. The necessity of doing what she advises, has been forced on the Authoress during a long life of much experience. In order to moderate, in some degree, the difficulty of managing a household, these suggestions are made. 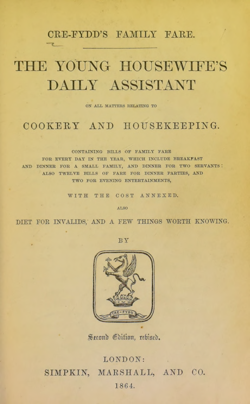 If the Authoress has aided the young housewife, and smoothed the way in the difficulties of housekeeping, and in that essential to health and comfort, good cooking, her object has been attained. It will be observed that the quantity of every ingredient used is carefully given, as well as the exact time required in cooking. Each receipt is perfect in itself, for it is found that reference to other receipts is, to the inexperienced, extremely perplexing. French terms are avoided. It is right to add that the whole of the receipts have been successfully used, with the simple aid of an ordinary range, and the usual appliances found in the kitchen of a small establishment.